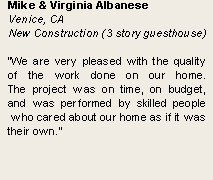 We have completed countless custom projects for homeowners across the Southland. From initial concept development through completed installation, we believe integrity, communication, and precise attention to detail form the foundation of our service. 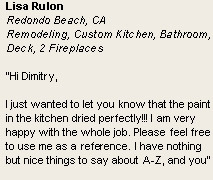 We believe that custom means complete personalization and it has always been the heart of what our kitchen designers do. 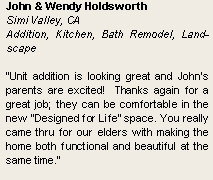 Custom is about meeting specific needs, unique designs, remodeling that will, when completed, make life easier. 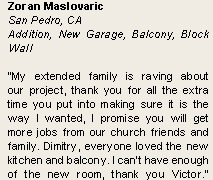 We promise to find the best fit between client, home and integral elements of the dream kitchen. Our kitchens are 'state-of-the-art', so you can be sure your kitchen will be a defining feature of your home and augment its beauty. The result is a kitchen that will be uniquely yours, fitting in harmoniously with your home, family and lifestyle. We are proud to offer two distinctive styles and visions in our custom cabinetry remodeling projects. Both Modern Traditional Luxury Designs and Contemporary "Less is More" Designs feature premium features that are standard on all our custom cabinetry. They include all wood case construction with finished plywood sides, solid wood dovetail drawers, hand sanding hand-rubbed finishes, full extension, under-mount soft-close drawer glides. Cabinetry can be framed, frameless, laminated, with over hundred choices for door styles and color finishes. 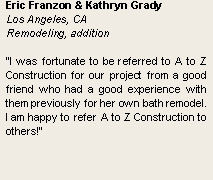 Semi-Custom cabinetry provided by A to Z Construction is constructed with features of expensive custom-built cabinetry, but with more affordability and value. Cabinetry showcases "Country Collection" and "Premium Collection" designs, variety of decorated accessories. All wood, dovetail drawers, self or soft-closing glides, molding, concealed hinges and more create better cabinets. Better cabinets are the key to make a better kitchen. Traditional framed construction, where the door is mounted on a front frame. Solid wood doors with cabinet’s plywood construction, dove-tail drawers for extra stability, cabinet grade under-mount glides, and more. Extensive selection accessories that could be integrated with standard cabinets make our kitchens unique and beautiful. Semi-Custom cabinetry allows you to upgrade your glides, full extension, moldings, pull- outs, and is suitable for home-owners who want a dream kitchen that's elegant, unique and affordable. For many years we know Quality is fundamental for our business, thus, our goal and mission is to design cabinets with highest quality and reasonable cost.